Duval topped the time sheets in the only practice session with the #2 Audi. Couple of incidents to report, firstly, Eric Lux who crashed at the first chicane, bringing out the the first of two red flags. The car was quite badly damaged. Also, Tracy Krohn had this big accident a little later in the session. Meanwhile, the Lotus thing seems resolved for the better for now. Doubt it'll be the last we'll hear about it though. Anthony Davidson says Toyota aren't chasing times. They know they can't match Audi over a single lap, so are concentrating instead on getting ready for the race. He says Toyota's hybrid system and better fuel mileage should keep them in the game, and that it may come down to a 2008 type scenario, where one team has an advantage on speed and one has the advantage on fuel mileage. Interestingly, that year, Audi won with better fuel mileage (and getting the strategy right regarding the weather) despite Peugeot being three seconds a lap faster in the dry. So don't rule Toyota out just yet. Duval continues his strong form and puts the #2 Audi provisionally quickest after today's session. Compounding Toyota's "problems", Rebellion seem to be hot on their heels in the timesheets. Interesting nugget overheard over the Eurosport commentary during Practice was Viper's engine redlines at only 4600rpm! I think even the Audi diesels rev higher than that! It does seem awfully strange that their 2013 car is slower than their 2012 car. How has that happened? Rebellion could be in the pound seat should the weather play as much of a part as some fear it will. Really? First I'd heard of that. What were they saying? It'd be cool to see them back in LMP1. I'm sure they'd have ample resources and cash to run a factory sports car team alongside their Formula One team, given they used to manage fine in the past. It is incredible that they are still third on the list for outright wins, given they haven't entered a car capable of winning in years. Corvette is in the last year of the C6 before the C7 hits the circuit next year. Given the current car is rather long in the tooth, I don't think it is too much of a surprise they're struggling for pace right now. Of course Corvette is off the pace. The car actually complies with ACO regulations. Are you sure it isn't just slow, despite all the BoP breaks it has been given? Second of three qualifying sessions is under way (just been red flagged as I type though). Mixed conditions with it dry on one side of the circuit, yet heavy rain on the other. Just part of the challenge. Oh, and the #7 tops the time sheets. Final qualifying session is go. Last time for teams to get their cars dialled into the track and to move up the order. Remember that there is no track action tomorrow. The cars then get a 45 minute warm-up session, before the race starts a few hours later. The good news is that Toyota seem to be more on Audi's pace today. The bad news is that the track is still drying, so whilst we're seeing improvements in the session, they aren't improvements out right. That's qualifying done. The #2 remains on top, ahead of the #1 and the #3. The #8 and #7 next (closer to Audi's pace today than combined times would suggest), with the #12, #13 and #21 completing the LMP1 field. Full run down of the times to follow. Olivier Pla in the #24 took the P2 pole from the #26 right at the death. Meanwhile, it is an Aston Martin lock-out in the GTE classes. An Aston one-two in Pro, with the #99 ahead of the #97, whilst the #95 takes pole in Am. Ooh look, it's the Deltawing...sort of. One of the presenters said that with that amount of interest from manufacturers (and given the growing audience) it would greatly interest Ferrari to produce a car capable of winning the event outright. Plus Porsche, their rivals, are back in the premier class. If I remember correctly he said he approached a Ferrari spokesperson who indicated they are monitoring the situation and will not rule out participating in LMP1, just not in the near future. Would the ZEOD still weigh 475kg? Especially with them batteries weighing quite a bit. Seem to remember that the weight of the car was an important contributor to that performance. Plus the as yet unraced Deltawing coupe in the ALMS (nothing to do with Nissan) has lights like that too. So I don't think it is a problem. I know that a lot of people have been very critical of Nissan about this. 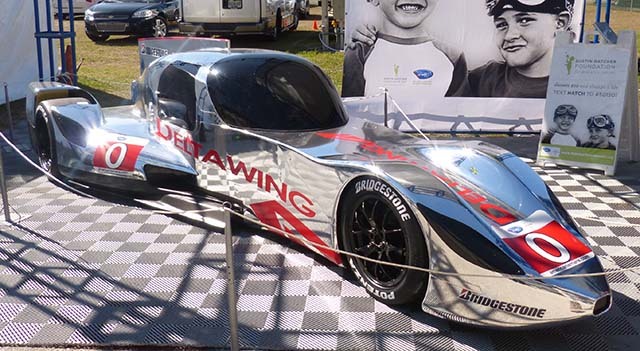 Few people like the Deltawing for some reason, but I'm fine with it. 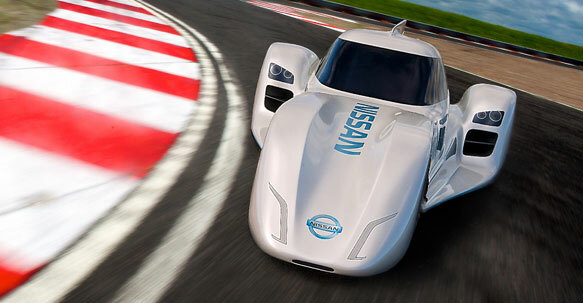 If this gets Nissan racing, and eventually leads to an LMP1 entry, then that's fine by me. Back to more immediate issues though, and today is the day. After all the build up and anticipation, the 90th anniversary of the world's greatest sports car race starts at 3pm today. That is 2pm UK time and something else for whatever part of the world you're in. Headline from this morning is the #7 Toyota topped the times. Oh, and I forgot to post this the other day. Toyota is looking at building an LMP2 car, alongside its LMP1 project, to race primarily in the USCR. It's interesting, but it does seem that is really against the rules. ACO says that no car manufacturer can enter LMP2 as anything other than an engine supplier, and that is perfectly understandable. Firstly, LMP2 is supposed to be a low(er) cost category for wealthy gentlemen drivers or youngsters climbing the ranks of motorsport. Secondly, they want the big manufacturers in the top class. I agree. I think LMP2 should be left to the smaller manufacturers, the likes of Alpine, Caterham, Morgan, etc. On the Toyota subject, there is always those doom mongers who doubt that Toyota will be around for very long. But everyone at the tracks seems to be saying the same thing - regardless of the result this year, Toyota will be back with a new LMP1 car next year. "The weather forecast predicts mixed conditions for Saturday until 19:00 CEST. Tonight it may get better, but at the end of the race the rain looks to return." Both Toyotas on a charge, already up to second and fourth. The safety car has been out for a little while now, due to a big shunt at Tetre Rouge. Substantial damage to not only the car, but the barrier as well. It was the pole sitting and pre-event favourite GT Am class Aston Martin. Before then, the #7 Toyota had closed to within four tenths of the lead Audi, with Davidson in he #8 having cleared the other two Audis and was pulling away. The #2 and #3 were only just managing to keep ahead of the two Rebellions. There was a massive fight already in LMP2 as well. We're about to go racing again.